The below correspondence was issued today to ALL editors and reporters at the four newspapers in the Triangle Region of North Carolina who participated in a diabolical and highly coordinated print smear campaign targeting Spencer C. Young in the prefacing stage to The Worst Bank Foreclosure Fraud In US History. Allow me to introduce myself – I am Spencer C. Young. It would appear I need no introduction because you collectively published over 60 false, malicious and disparaging articles about me. Nevertheless, I do so in deference to those who receive this letter, but were not involved in the criminal acts described herein – for it is they who will most likely consider whether yours remains an organization they wish to be associated with . . . particularly after observing your “official” response to my conciliatory offer. This transmittal addresses: (1) Your Role (in this scandal); (2) The Damages (thus caused); and (3) Next Steps (including my offer). You published at least 65 articles about me in the context of my ownership of The Courtyard of Chapel Hill, (“TCoCH”) pursuant to a vicious smear campaign that was a key prefacing factor in “the worst bank foreclosure fraud in US history”. An evaluation of these articles revealed a profoundly obnoxious repetition of bombastic falsehoods and misrepresentations that a Manure Meter Rating System had to be employed in the analysis. Town’s Failure To Enforce Parking Permit – Over the previous two years I had owned the property, the Town of Chapel Hill had dutifully enforced compliance with the Special Use Permit (which provided parking “exclusively for patrons of TCoCH”), but then inexplicably failed to do so in late July 2007, in contradiction of its express mandate and assurances provided by then Mayor Kevin Foy and Mayor Pro Tem Bill Strom. And while you were prolific in your reporting of my ownership of The Courtyard of Chapel Hill, you astonishingly censored reporting on my ownership of The Pit Stop of Durham and three other North Carolina properties (including my residence in Chapel Hill, NC), which were subjected to 20 separate elements of foreclosure fraud, and resulted in the filing of a 31-count criminal indictment against Paragon Commercial Bank executives and attorneys at Poyner & Spruill. These facts were articulated in a press-release (also suspiciously ignored by you), which was issued on January 29, 2010, four days prior to a violent and unlawful eviction executed by a SWAT team of over a dozen emotionally frenzied deputies on a mortgage that was: (1) never delinquent; (2) never in default; and (3) PAID-IN-FULL !! After several assassination attempts failed, I was subjected to disturbing police brutality that coincided with that which was depicted in the movie Changeling. I invite you to watch the video, titled Art Imitating Life . 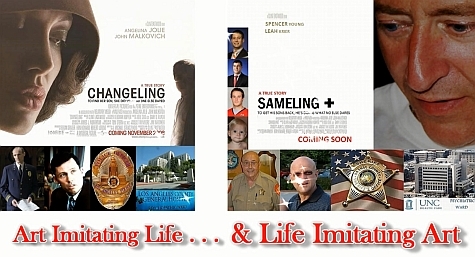 . . and Life Imitating Art as well as examine the presentation slides, which accompanied the criminal & civil rights complaints that have been filed against the Orange County Sheriff’s Dept., at both the federal and state levels. 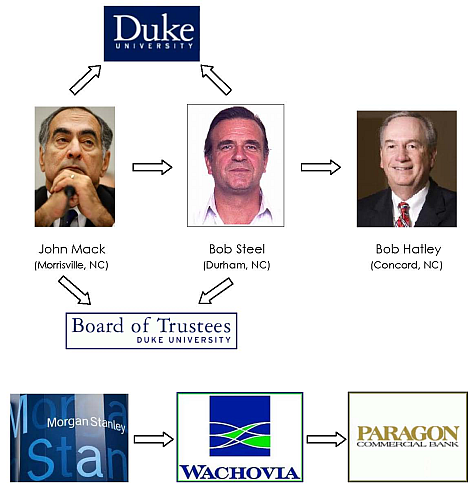 Now why would so many crazy, over-the-top events occur in North Carolina and lead to the worst bank foreclosure fraud in U.S. history? The answer lies in HOW this scandal escalated and the Bank CEOs who are directly involved. You were also made aware of all this, but again reported NOTHING. In short, you knowingly reported LIES and deliberately withheld the TRUTH. This evidences a profound lack of journalistic integrity, and suggests criminal complicity in cover-up of MorganStanleyGate, which is the scandal behind ALL of the bizarre over-the-top events described herein. Importantly, you need to understand the damages you have played a role in causing. Jackson Young – who will turn 4 next week, and where up until the vicious UNLAWFUL eviction via SWAT team, I had cared for this little boy just about every day of his life. I love my sons more than you can imagine, and know that YOUR vicious articles assassinated my character with impunity in the public forum and played an instrumental role in destroying my family and taking my sons out of my life. Well I’m committed to resurrecting what vestiges remain of my family and getting my sons back in my life and I’ve articulated HOW I will go about doing this in a two-minute video , which leads to me to the Next Steps. I am all about optimism and productive achievement, and I possess well-founded core values and guiding principles, which I apply to everyday living. However, with this transmittal, I am notifying you that your organizations (and the individuals responsible) are now metaphorically in my cross-hairs, and thus face SUBSTANTIAL downside. Whether the ramifications of your misdeeds will come to fruition will be entirely up to you. For I am hereby giving you the opportunity to issue explicit unambiguous retractions of each and every falsehood contained in your past malicious articles. By doing so to my satisfaction, I will not pursue significant civil claims against your organization, nor any of the individual reporters and editors responsible for publishing those god-forsaken articles. And while I cannot speak for the U.S. Justice Dept., the FBI, or other law enforcement agencies who will conduct the related criminal investigations, your cooperation in their prosecutorial efforts may obviate that risk for you also, but I surmise you’ll have to start naming names. Feel free to respond by email at responses@scyinv.com, and although I don’t expect you to take me up on this gracious conciliatory offer, I can at least have a clear conscience knowing I availed you the opportunity to avoid what may otherwise become an Armageddon of dire consequences. PS: If you have information that would be helpful in resolving this matter, please send a text message indicating such to 919-357-2844. You will be assigned a dedicated encrypted email account, which you can utilize for such communications.